Snapdragon is a suite of system on a chip (SoC) semiconductor products for mobile devices designed and marketed by Qualcomm Technologies Inc. The Snapdragon central processing unit (CPU) uses the ARM RISC instruction set. A single SoC may include multiple CPU cores, a graphics processing unit (GPU), a wireless modem, and other software and hardware to support a smartphone's global positioning system (GPS), camera, gesture recognition and video. Snapdragon semiconductors are embedded in devices of various systems, including Android and Windows Phone devices. They are also used for netbooks, in cars, wearable devices and other devices. In addition to the processors, the Snapdragon line includes modems, wi-fi chips and mobile charging products. The first Snapdragon product to be made available to consumer device manufacturers was the QSD8250, which was released in November 2007. It included the first 1 GHz processor for mobile phones. Qualcomm introduced its "Krait" microarchitecture in the second generation of Snapdragon SoCs in 2011, allowing each processor core to adjust its speed based on the device's needs. At the 2013 Consumer Electronics Show, Qualcomm introduced the first of the Snapdragon 800 series and renamed prior models as the 200, 400 and 600 series. Several new iterations have been introduced since, such as the Snapdragon 805, 810, 615 and 410. Qualcomm re-branded its modem products under the Snapdragon name in December 2014. As of 2018[update], Asus, HP and Lenovo have begun selling laptops with Snapdragon-based CPUs running Windows 10 under the name "Always Connected PCs", marking an entry into the PC market for Qualcomm and the ARM architecture. Qualcomm announced it was developing the Scorpion central processing unit (CPU) in November 2007. The Snapdragon system on chip (SoC) was announced in November 2006 and included the Scorpion processor, as well as other semiconductors. This also included Qualcomm's first custom Hexagon digital signal processor (DSP). According to a Qualcomm spokesperson, it was named Snapdragon, because "Snap and Dragon sounded fast and fierce." The following month, Qualcomm acquired Airgo Networks for an undisclosed amount; it said Airgo's 802.11a/b/g and 802.11n Wi-Fi technology would be integrated with the Snapdragon product suite. Early versions of Scorpion had a processor core design similar to the Cortex-A8. The first Snapdragon shipments were of the QSD8250 in November 2007. According to CNET, Snapdragon claim to fame was having the first 1 GHz mobile ma processor. Most smartphones at the time were using 500 MHz processors. The first generation of Snapdragon products supported a 720p resolution, 3D graphics and a 12-megapixel camera. By November 2008, 15 device manufacturers decided to embed Snapdragon semiconductors in their consumer electronics products. In November 2008, Qualcomm announced it would also compete against Intel in the netbook processor market with dual-core Snapdragon system-on-chips planned for late 2009. It demonstrated a Snapdragon processor that consumed less power than Intel chips announced around the same time and claimed it would also cost less when released. That same month, Qualcomm introduced a Snapdragon-based prototype netbook called Kayak that used 1.5 GHz processors and was intended for developing markets. In May 2009, Java SE was ported and optimized for Snapdragon. At the November 2009 Computex Taipei show, Qualcomm announced the QSD8650A addition to the Snapdragon product suite, which was based on 45 nanometer manufacturing processes. It featured a 1.2 GHz processor and had lower power consumption than prior models. By late 2009, smartphone manufacturers announced they would be using Snapdragon SoCs in the Acer Liquid Metal, HTC HD2, Toshiba TG01 and the Sony Ericsson Xperia X10. Lenovo announced the first netbook product using Snapdragon SoCs that December. According to PC World, mobile devices using Snapdragon had better battery life and were smaller in size than those using other SoCs. By June 2010, Snapdragon chips were embedded in 20 available consumer devices and incorporated into 120 product designs in development. Apple had a dominant market position for smartphones at the time and did not incorporate Snapdragon into any of its products. The success of Snapdragon therefore relied on competing Android phones, such as Google's Nexus One and the HTC Incredible, challenging Apple's market position. Android devices did end up taking market share from the iPhone and predominantly used Snapdragon. There was an "unconfirmed but widely circulated report" speculating that Apple was going to start using Snapdragon SoCs in Verizon-based iPhones. As of 2012, Apple was still using their own Ax semiconductor designs. Support for the Windows Phone 7 operating systems was added to Snapdragon in October 2010. By 2011 Snapdragon was embedded in Hewlett Packard's WebOS devices and had a 50% market share of a $7.9 billion smartphone processor market. By 2012, the Snapdragon S4 (Krait core) had taken a dominant share from other Android system-on-chips like Nvidia Tegra and Texas Instruments OMAP which caused the latter to exit the market. As of July 2014, the market share of Android phones had grown to 84.6 percent, and Qualcomm's Snapdragon chips were embedded in 41% of smartphones. However, the September 2013 debut of Apple's 64-bit A7 chip in the iPhone 5S forced Qualcomm to release a competing 64-bit product, despite the capable performance of the Snapdragon 800/801/805, since their existing Krait cores were only 32-bit. The first 64-bit SoCs, the Snapdragon 808 and 810, were rushed to market using generic Cortex-A57 and Cortex-A53 cores and suffered from overheating problems and throttling, particularly the 810, which led Samsung to stop using Snapdragon for its Galaxy S6 flagship phone, and Galaxy Note 5 phablet. Snapdragon chips are also used in most Android-based smartwatches. Snapdragon products have also been used in virtual reality products, in vehicles like the Maserati Quattroporte and Cadillac XTS and in other applications. In June 2010, Qualcomm began sampling the third generation of Snapdragon products; two dual-core 1.2 GHz system on chips (SoC) called the Mobile Station Modem (MSM) 8260 and 8660. The 8260 was for GSM, UMTS and HSPA+ networks, while the 8660 was for CDMA2000 and EVDO networks. That November Qualcomm announced the MSM8960 for LTE networks. In early 2011, Qualcomm announced a new processor architecture called Krait, which used the ARM v7 instruction set, but was based on Qualcomm's own processor design. The processors were called S4 and had a feature named Asynchronous Symmetrical Multi-Processing (aSMP), meaning each processor core adjusted its clock speed and voltage based on the device's activity in order to optimize battery usage. Prior models were renamed to S1, S2 and S3 to distinguish each generation. The S4-based generation of Snapdragon SoCs began shipping to product manufacturers with the MSM8960 in February 2012. In benchmark tests by Anandtech, the MSM8960 had better performance than any other processor tested. In an overall system benchmark, the 8960 obtained a score of 907, compared to 528 and 658 for the Galaxy Nexus and HTC Rezound respectively. In a Quadrant benchmark test, which assesses raw processing power, a dual-core Krait processor had a score of 4,952, whereas the quad-core Tegra 3 was just under 4,000. The quad-core version, APQ8064, was made available in July 2012. It was the first Snapdragon SoC to use Qualcomm's Adreno 320 graphics processing unit (GPU). Adoption of Snapdragon contributed to Qualcomm's transition from a wireless modem company to one that also produces a wider range of hardware and software for mobile devices. In July 2011 Qualcomm acquired certain assets from GestureTek in order to incorporate its gesture recognition intellectual property into Snapdragon SoCs. In mid-2012 Qualcomm announced the Snapdragon software development kit (SDK) for Android devices at the Uplinq developer conference. The SDK includes tools for facial recognition, gesture recognition, noise cancellation and audio recording. That November Qualcomm acquired some assets from EPOS Development in order to integrate its stylus and gesture recognition technology into Snapdragon products. It also collaborated with Microsoft to optimize Windows Phone 8 for Snapdragon semiconductors. By 2012, the Snapdragon S4 (Krait core) had taken a dominant share from other Android system-on-chips like Nvidia Tegra and Texas Instruments OMAP which caused the latter to exit the market. As of July 2014, the market share of Android phones had grown to 84.6 percent, and Qualcomm's Snapdragon chips powered 41% of smartphones. However, the September 2013 debut of Apple's 64-bit A7 chip in the iPhone 5S forced Qualcomm to rush out a competing 64-bit solution, despite the capable performance of the Snapdragon 800/801/805, since their existing Krait cores were only 32-bit. The first 64-bit SoCs, the Snapdragon 808 and 810, were rushed to market using generic Cortex-A57 and Cortex-A53 cores and suffered from overheating problems and throttling, particularly the 810, which led to Samsung ditching Snapdragon for its Galaxy S6 flagship phone. The entry-level 200 series was expanded with six new processors using 28 nanometer manufacturing and dual or quad-core options in June 2013. The entry-level Snapdragon 210, intended for low-cost phones, was announced in September 2014. The Snapdragon 820, with the in-house 64-bit Kyro core, largely solved the performance and heat problems of the Snapdragon 810. The latest processor Qualcomm has brought up is the Snapdragon 855  with the highest clock speed in the market currently, competing mainly against Samsung's exynos 9810, Kirin 980 and Apple's A11 Bionic Chipset. Qualcomm announced the Snapdragon 835 SoC on November 17, 2016, which was built using Samsung's 10-nanometer FinFET process. The new processor will have 30 percent more parts within the same space and will have 27 percent better performance with 40 percent less power. Due to Samsung's role in manufacturing the chip, its mobile division also acquired the initial inventory of the chip. This means that no other OEM will be able to manufacture products containing the 835 until the release of Samsung's next flagship device, the Galaxy S8. Snapdragon system on chip products typically include a graphics processing unit (GPU), a global positioning system (GPS) and a cellular modem integrated into a single package. It has software included that operates graphics, video and picture-taking. There are 19 different Snapdragon processors under the 400, 600 and the 800 product families spanning from low to high-end respectively, as well as wi-fi and mobile charging products. Some of their components include the Adreno graphics processing, the Qualcomm Hexagon DSP and processors using Qualcomm's S4 processor architecture. In addition to smartphones, the 400 series is used in smart watches and the 602A is intended for electronics in cars. The current Snapdragon naming scheme was implemented after the Snapdragon 800 family was announced at the 2013 Consumer Electronics Show; prior models were renamed to the 200, 400 or 600 series. A new Snapdragon 600 was also released, which by mid-year was embedded in most new Android devices. The 400 family is entry-level, the 600 is mass-market or mid-range, and 800 family is for high-end or flagship phones. The Snapdragon 805 was released that November. The 410, which is intended for low-cost phones in developing nations, was announced the following month. In January 2014, Qualcomm introduced a modified version of the Snapdragon 600 called 602A that is intended for in-car infotainment screens, backup cameras, and other driver assistance products. The quad-core Snapdragon 610 and eight-core 615 were announced in February 2014. The Snapdragon 808 and 810 were announced in April 2014. The Snapdragon 835, announced in November 2017, is the first Qualcomm SOC that is built on a 10 nm architecture. Qualcomm's new flagship chip for 2018, the 845, was announced in December 2017. According to Qualcomm, the 845 is 25-30% faster than the 835. In February 2015, Qualcomm re-branded its stand-alone modem products under the Snapdragon name; they were distinguished from SoCs using the "x" designation, such as the X7 or X12 modem. The first Snapdragon modem for 5G networks, the X50, was announced in late 2016. This was followed by the 2GBs X24 modem on a 7 nanometer manufacturing process that was announced in February 2018. According to CNET, these phones were growing in US market share and ranked highly in CNET reviews due to their responsiveness. Snapdragon SoCs are also used in most Windows phones and most phones entering the market in mid-2013. The LG G2 was the first phone to market using the Snapdragon 800 in August 2013. In 2017 the 660 and 630 replaced the 653 and 626 mid-range models and several chips in the 400 product family were revved. In February 2017, Qualcomm introduced the Snapdragon X20, intended for 5G cell phone networks, and two new chips for 802.11ax commercial wi-fi networks. This was followed by the addition of the 636 to the 600 product family that October, which Qualcomm said would be 40 percent faster than the 630. In August 2018, the Snapdragon 632, 439 and 429 were released. The new SoC is aimed at mid-range devices such as the Moto G6 Play, Huawei Honor 7A and Nokia 5. In December 2018, Qualcomm announced the 8cx at their Snapdragon Tech Summit 2018. The 8cx is Qualcomm's first SoC specifically designed for Always Connected PC (ACPC) platform. Unlike Qualcomm's past ACPC SoCs which were just their respective mobile SoCs at higher TDP. Qualcomm also showcased their Snapdragon X50 5G modem and Snapdragon 855. Benchmark tests of the Snapdragon 800's processor by PC Magazine found that its processing power was comparable to similar products from Nvidia. Benchmarks of the Snapdragon 805 found that the Adreno 420 GPU resulted in a 40 percent improvement in graphics processing over the Adreno 330 in the Snapdragon 800, though there were only slight differences in processor benchmarks. Benchmarks of the Snapdragon 801 inside an HTC One found a "bump all around" in benchmark improvements over the 800. In 2015, Samsung's decision not to use the Snapdragon 810 in its Galaxy S6 had a significant detrimental impact on Snapdragon's revenues and reputation. Benchmark tests by Ars Technica confirmed rumors that the 810 under-performed lower-end models and had overheating issues. A Qualcomm spokesperson said these tests were done with early versions of the 810 that weren't ready for commercial use. An updated version was released and was found to moderately improve thermal throttling, GPU clock speeds, memory latency, and memory bandwidth when tested in a commercial product, the Xiaomi Mi Note Pro. Additionally, the 820/821, 835 and 845 performed substantially better. Since the 820 Qualcomm lead the industry in sustained GPU performance and perf/W until the release of the Apple A12. The 835 and 845 both outperformed and were more effificent than Samsung's Exynos 8895 and 9810. ^ "Find Snapdragon Smartphones, Tablets and Smart Devices". Qualcomm. 8 December 2015. Retrieved 17 April 2018. ^ "ARM is going after Intel with new chip roadmap through 2020". Windows Central. Retrieved 6 October 2018. ^ "Always Connected PCs, Extended Battery Life 4G LTE Laptops | Windows". www.microsoft.com. Retrieved 6 October 2018. ^ "Snapdragon seeds Qualcomm's future". Electronic Engineering Times. 4 June 2007. Retrieved 17 April 2018. ^ a b c BDTI (5 December 2007). 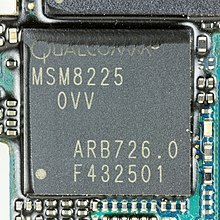 "Analysis: QualComm's 1 GHz ARM "Snapdragon"". Electronic Engineering Times. Retrieved 17 April 2018. ^ "Qualcomm rolls out Snapdragon for mobile". New Media Age. 16 November 2006. ^ Oram, John (12 October 2011). "Qualcomm announces its 2012 superchip: 28NM Snapdragon S4". VRWorld. Retrieved 17 April 2018. ^ Kewney, Guy (May 2009). "Puff the magic Snapdragon". Personal Computer World. ^ Taylor, Colleen (December 2006). "Qualcomm's Q4 Shopping Spree". Electronics News. ^ Hachman, Mark (4 December 2006). "Qualcomm Buys Airgo, Bluetooth Assets". ExtremeTech. Retrieved 17 April 2018. ^ a b c d Crothers, Brooke (3 February 2009). "Toshiba handheld hits 1GHz with 'Snapdragon'". CNET. Retrieved 17 April 2018. ^ a b Crothers, Brooke (6 September 2009). "Intel and Qualcomm Eye Each Other's Terrain". Retrieved 17 April 2018. ^ Sidener, Jonathan (1 August 2008). "Qualcomm and Google prepare reply to iPhone". Union-Tribune. Retrieved 17 April 2018. ^ Merritt, Rick (12 November 2008). "Qualcomm launches low-cost PC alternative". Electronic Engineering Times. Retrieved 17 April 2018. ^ a b Sidener, Jonathan (18 November 2008). "Qualcomm chip shows versatility". Union-Tribune San Diego. Retrieved 3 October 2014. ^ a b Clark, Don (13 November 2008). "Qualcomm Pushes Beyond Cellphones". The Wall Street Journal. Retrieved 2 October 2014. ^ Markoff, John (1 July 2008). "Chips for mobile world pose challenge to Intel". International Herald Tribune. Retrieved 17 April 2018. ^ Markoff, John (30 June 2008). "Intel's Dominance Is Challenged by a Low-Power Upstart". The New York Times. Retrieved 17 April 2018. ^ "Next battleground for processors: powering the consumer computing device". Electronic Engineering Times. 14 July 2008. Retrieved 17 April 2018. ^ Merritt, Rick (12 November 2008). "Qualcomm launches low-cost PC alternative". Retrieved 17 April 2018. ^ Taft, Darryl (6 May 2009). "Sun and Qualcomm Tweak Java for Netbooks". eWeek. Retrieved 2 October 2014. ^ Eddy, Nathan (1 June 2009). "Qualcomm Debuts 45nm Snapdragon Chipset". eWeek. Retrieved 17 April 2018. ^ Perez, Marin (1 June 2009). "Qualcomm Shows Off New Mobile Chips". InformationWeek. Retrieved 17 April 2018. ^ Maisto, Michelle (14 October 2009). "Acer Liquid Smartphone Uses Android, Qualcomm's Snapdragon". eWeek. Retrieved 17 April 2018. ^ Eddy, Nathan (13 November 2009). "Qualcomm Announces Smartphone Chipsets, Snapdragon Smartbook". Retrieved 17 April 2018. ^ Deagon, Brian (4 December 2009). "Qualcomm Plotting Ways To Push New Type Of Device". Investor's Business Daily. ^ Allen, Danny; Nystedt, Dan; Fletcher, Owen; Shah, Agam (August 2009). "Latest Laptop Trends From Asia's Big Tech Show". PC World. ^ a b Freeman, Mike (17 June 2010). "Qualcomm hoping to feast on Snapdragon". Union Tribune San Diego. Retrieved 2 October 2014. ^ a b Fikes, Bradley (10 January 2010). "Qualcomm pushes to get beyond cell phones". Union Tribune San Diego. Retrieved 17 April 2018. ^ a b Freeman, Mike (18 October 2010). "Qualcomm gets Snapdragon in new Windows phones". San Diego Union Tribune. Retrieved 17 April 2018. ^ "Qualcomm to buy Atheros for $3.2 billion". Associated Press. 6 January 2011. Retrieved 17 April 2018. ^ Krause, Reinhardt (27 September 2012). "Qualcomm's Snapdragon Mobile Chips Take On MediaTek". Investor's Business Daily. Retrieved 17 April 2018. ^ Fitchard, Kevin (1 June 2011). "Qualcomm struts is mobile gaming stuff". Connected Planet. ^ Caulfield, Brian (18 July 2012). "No Factories, No Phones, No Fuss: How Qualcomm Grabs Wireless Profits". Forbes. Retrieved 17 April 2018. ^ a b "Wednesday Poll: Preferred Mobile Processor?". Droid Life. 26 September 2012. Retrieved 4 October 2017. ^ a b Smith, Chris (31 July 2014). "Strategy Analytics: 85% of phones shipped last quarter run Android". BGR. Retrieved 17 April 2018. ^ a b Cohen, Peter; Cohen, Peter (16 December 2013). "Apple's 64-bit A7 chip "hit us in the gut," says Qualcomm employee". iMore. Retrieved 4 October 2017. ^ a b c Lee, Jungah; King, Ian (20 January 2015). "Samsung Said to Drop Qualcomm Chip From Next Galaxy S". Bloomberg. Retrieved 17 April 2018. ^ a b c Cunningham, Andrew (23 April 2015). "In-depth with the Snapdragon 810's heat problems". Ars Technica. Retrieved 17 April 2018. ^ Sun, Leo (29 March 2015). "Will Intel Corporation's Curie Conquer the Internet of Things and Wearables Markets?". Fox Business. ^ Agomuoh, Fionna (8 January 2015). "Eyeing Growth, Mobile King Qualcomm Targets The Internet Of Things". International Business Times. Retrieved 17 April 2018. ^ Maisto, Michelle (1 June 2010). "Qualcomm Begins Shipping Dual-CPU, 1.2GHz Snapdragon". eWeek. Retrieved 17 April 2018. ^ a b Klug, Brian (30 March 2011). "Dual Core Snapdragon GPU Performance Explored - 1.5 GHz MSM8660 and Adreno 220 Benchmarks". Retrieved 17 April 2018. ^ Gardner, David (18 November 2010). "Qualcomm Details Faster Snapdragon Chipset". InformationWeek. Retrieved 17 April 2018. ^ Maisto, Michelle (18 November 2010). "Qualcomm Snapdragon Processor Redesign Targets Smartphones, Tablets". eWeek. Retrieved 17 April 2018. ^ Clarke, Peter (16 February 2011). "Qualcomm tips quad-core Snapdragon plan". Electronic Engineering Times. Retrieved 17 April 2018. ^ Whitwam, Ryan (13 October 2011). "How Snapdragon S4 and Tegra 3 manage ARM cores differently". Retrieved 17 April 2018. ^ Shimpi, Anand Lal (3 August 2011). "Qualcomm's Updated Brand: Introducing Snapdragon S1, S2, S3 & S4 Processors". AnandTech. Retrieved 17 April 2018. ^ Whitwam, Ryan (22 February 2012). "Why Qualcomm's Snapdragon S4 has the competition on the defensive". ExtremeTech. ^ Klug, Brian; Shimpi, Anand (21 February 2012). "Qualcomm Snapdragon S4 (Krait) Performance Preview". AnAndTech. Retrieved 17 April 2018. ^ Whitwam, Ryan (28 March 2012). "Early Snapdragon S4 benchmarks could spell trouble for Tegra 3". Retrieved 17 April 2018. ^ Anthony, Sebastian (25 July 2012). "Qualcomm's quad-core Snapdragon S4 eats Tegra and Exynos for breakfast". ExtremeTech. Retrieved 17 April 2018. ^ Fitchard, Kevin (3 June 2011). "The Rise of Qualcomm Computing". Connected Planet. ^ Burt, Jeffrey (25 July 2011). "Qualcomm Buying Gesture Recognition Assets From GestureTek". Retrieved 17 April 2018. ^ a b Kim, Ryan (16 July 2012). "Qualcomm Aims to Make Snapdragon a Consumer Brand". Retrieved 17 April 2018. ^ Wauters, Robin (16 November 2012). "Qualcomm Technologies, a subsidiary of semiconductor". The Next Web. Retrieved 17 April 2018. ^ a b Shah, Agam (21 June 2012). "Windows Phone 8 smartphones to run Qualcomm's Snapdragon S4 chip". IDG News Service. Retrieved 17 April 2018. ^ Gomez, Kevin (24 June 2013). "Qualcomm adds six new processors to its Snapdragon 200 class". ^ Cunningham, Andrew (11 September 2014). "Snapdragon 210 brings LTE to entry-level phones, but not 64-bit Snapdragon 208 will also serve as a cheaper 3G-only option". Ars Technica. ^ Tibken, Shara. "Qualcomm Snapdragon 855 will bring advanced features to 2019 5G phones". CNET.com. Retrieved 13 December 2018. ^ Barrett, Brian (3 January 2017). "What the Snapdragon 835 Chip Means for Your Next Smartphone". Wired.com. Retrieved 17 April 2018. ^ Martin, Chris (5 January 2017). "Meet the new chip that will likely power the Galaxy S8, LG G6, HTC 11 and other 2017 flagship phones". PC Advisor. Retrieved 17 April 2018. ^ "Report: Snapdragon 835 will launch first in Galaxy S8, others have to wait". PC World. Retrieved 17 April 2018. ^ "Microsoft, Qualcomm Partner to Bring Windows 10 to Snapdragon-Powered Laptops". The Apps Central. 31 May 2017. Retrieved 17 April 2018. ^ a b c Low, Cherlynn (6 December 2017). "Qualcomm's Snapdragon 845 doubles down on cameras and AI". Engadget. Retrieved 17 April 2018. ^ Simon, Michael (6 December 2017). "Five ways the Snapdragon 845 chip will impact 2018 Android flagship phones". PCWorld. Retrieved 17 April 2018. ^ Tibken, Shara (27 February 2018). "Qualcomm's newest chips will give a boost to AI in lower-cost phones". CNET. Retrieved 24 March 2018. ^ Smith, Ryan (27 February 2018). "Qualcomm Announces Snapdragon 700 Series Platform: Carving Out A Niche for Sub-Premium". AnandTech. Retrieved 24 March 2018. ^ Whitwam, Ryan (26 August 2011). "How Qualcomm's Snapdragon ARM chips are unique". ExtremeTech. Retrieved 17 April 2018. ^ Veverka, Mark (17 March 2012). "Qualcomm Inside". Barron's. Retrieved 17 April 2018. ^ Lipsky, Jessica (31 July 2014). "Q'comm Shares a Wearable Strategy". Electronic Engineering Times. Retrieved 17 April 2018. ^ a b Silbert, Sarah (6 January 2014). "With the Snapdragon 602A, Qualcomm looks to improve the connected car". Engadget. ^ Hruska, Joel (8 January 2013). "Qualcomm's Keynote was the most awkward affair in the history of ever". ExtremeTech. Retrieved 17 April 2018. ^ buttersWise, normally (19 June 2013). "Qualcomm's Snapdragon 800 benchmarked, sports extremely fast GPU". Ars Technica. Retrieved 12 February 2018. ^ a b Hruska, Joel (18 February 2015). "Qualcomm rides to war: Multiple new CPUs, modems announced ahead of Mobile World Congress". ExtremeTech. Retrieved 17 April 2018. ^ "Qualcomm outs Snapdragon 800 and 600: up to 2.3GHz quad-core, 4K video, due by mid 2013". Engadget. 7 January 2013. Retrieved 17 April 2018. ^ Poeter, Damon (20 November 2013). "Qualcomm Unveils Next-Gen Snapdragon 805". PC Magazine. Retrieved 17 April 2018. ^ Dolcourt, Jessica; Tibken, Shara (9 December 2013). "Qualcomm's Snapdragon 410 brings 64-bit, LTE to emerging markets". Retrieved 17 April 2018. ^ Cunningham, Wayne (15 January 2015). "Smart phone, smarter car". CNET. Retrieved 17 April 2018. ^ Poeter, Damon (24 February 2014). "Qualcomm Spices Up Snapdragon 600 Line With New 64-Bit Chips". PC Magazine. ^ Poeter, Damon (7 April 2014). "Qualcomm Unveils Next-Gen Snapdragon 810, 808 Chips". PC Magazine. ^ Shah, Agam (28 July 2014). "Qualcomm planting seeds for 4K video, silicon brains in mobile devices". PCWorld. Retrieved 17 April 2018. ^ Captain, Sean (17 October 2016). "The Wild Technology That Will Make 5G Wireless Work". Fast Company. Retrieved 17 April 2018. ^ "Qualcomm Unveils Fast Snapdragon X24 LTE Modem for Mobile Devices". eWEEK. 20 March 2018. Retrieved 24 March 2018. ^ Dolcourt, Jessica (20 June 2012). "Qualcomm confirms Snapdragon S4 processor for Windows Phone". CNET. Retrieved 17 April 2018. ^ Anthony, Sebastian (9 August 2013). "Surface RT 2: Tegra confirmed, despite superiority of Snapdragon and Bay Trail". Retrieved 17 April 2018. ^ Whitwam, Ryan (7 August 2013). "LG G2 announced: 5.2-inch 1080p, first commercial Snapdragon 800 phone". ExtremeTech. Retrieved 17 April 2018. ^ "Coming soon to a $250 phone near you: Qualcomm's Snapdragon 660 and 630 chips". Ars Technica. 9 May 2017. Retrieved 17 April 2018. ^ Frumusanu, Andrei (11 February 2016). "Qualcomm Announces Snapdragon 625, 425 & 435 Mid- and Low-End SoCs". AnandTech. Retrieved 17 April 2018. ^ Low, Aloysius (27 June 2017). "Qualcomm's Snapdragon 450 makes $200 phones faster, last longer". CNET. Retrieved 10 February 2018. ^ "Qualcomm's New Modem can Beat 1 Gigabit Speeds, in Theory". Fortune. 21 February 2017. Retrieved 17 April 2018. ^ Ngo, Dong (13 February 2017). "With Qualcomm's new 802.11ax chips, the future of Wi-Fi is here". CNET. Retrieved 24 March 2018. ^ Whitwam, Ryan (17 October 2017). "Qualcomm Announces Snapdragon 636 Chip with 40 Percent Speed Boost". ExtremeTech. Retrieved 17 April 2018. ^ "Qualcomm Snapdragon 632, 439 & 429 For Mass Market Phones Announced | Android News". AndroidHeadlines.com |. 26 June 2018. Retrieved 6 August 2018. ^ Kudev, Stefan. "Qualcomm releases Snapdragon 632, 439, 429 SoCs". www.insightportal.io. Retrieved 6 August 2018. ^ Cutress, Ian. "Qualcomm Tech Summit, Day 3: Snapdragon 8cx, the New ACPC SoC". www.anandtech.com. Retrieved 28 January 2019. ^ Segan, Sascha (19 June 2013). "Benchmarking Qualcomm's Snapdragon 800". PC Magazine. Retrieved 17 April 2018. ^ Anthony, Sebastian (22 May 2014). "Snapdragon 805 benchmarked: Krait's last hurrah, and the arrival of a new GPU king". ExtremeTech. Retrieved 17 April 2018. ^ Segan, Sascha (25 March 2014). "Why the HTC One (M8)'s Snapdragon 801 Is So Snappy". PC Magazine. ^ Rubin, Ben (2 March 2015). "What's inside your smartphone? Most customers don't care". CNET. Retrieved 17 April 2018. ^ Cunningham, Andrew (30 April 2015). "Qualcomm's Snapdragon 808 doesn't get so hot under the collar". Retrieved 17 April 2018. ^ McGregor, Jay (6 May 2015). "Qualcomm Finally Speaks Out About Samsung And Snapdragon". Forbes. Retrieved 17 April 2018. ^ D., Luis (6 May 2015). "Revised Snapdragon 810 boasts performance and thermal improvements in Xiaomi Mi Note Pro benchmarks". PhoneArena. Retrieved 17 April 2018. ^ Ho, Joshua (18 June 2015). "Comparing Snapdragon 810 v2 and v2.1: More Memory Bandwidth, Higher Clocks". AnAndTech. Retrieved 17 April 2018. ^ Frumusanu, Ryan Smith, Andrei. "The Qualcomm Snapdragon 820 Performance Preview: Meet Kryo". www.anandtech.com. Retrieved 28 January 2019. ^ Frumusanu, Andrei; Smith, Ryan (12 February 2018). "The Snapdragon 845 Performance Preview: Setting the Stage for Flagship Android 2018". AnandTech. Retrieved 24 March 2018. ^ Humrick, Matt; Smith, Ryan (22 March 2017). "The Qualcomm Snapdragon 835 Performance Preview". AnandTech. Retrieved 24 March 2018. ^ Frumusanu, Andrei. "The Samsung Galaxy S9 and S9+ Review: Exynos and Snapdragon at 960fps". www.anandtech.com. Retrieved 28 January 2019. Boxall, Andy (24 January 2015). "When cities adopt smartphone chips, trash cans talk and street lamps have ears". Digital Trends. This page was last edited on 22 April 2019, at 01:11 (UTC).